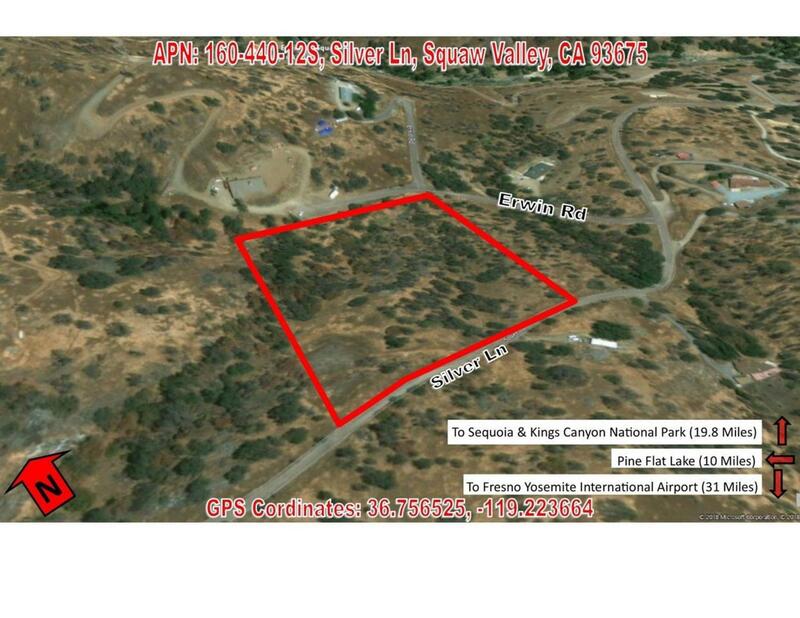 Stunning 4.43 acre (192,970 SF) residential lot available within a quant, established mountain community of Squaw Valley. Perfect building site at 1,750' elevation with direct paved street access overlooking beautiful 360 views of surrounding High Sierra foothills. The southeast corner of the property is the highest point with a large level lot that overlooks the hillside of the property, a seasonal creek, mature trees, and surrounding mountain scenery. Located on Silver Lane, a paved street accessible from both CA-180 and Elwood Road (430' of frontage). Power source is within a few feet from property. Easy access from Silver Ln within 3/4 mile North of Highway 180. Just minutes to the Fresno County Library, Sheriff's office, restaurants and gas stations. 10 miles to Pine Flat Lake, 19 miles to Sequoia & Kings Canyon National Park, and only 31 miles from Fresno/Clovis. Seller will carry loan at reasonable terms with only $7,000 down!